For the sake of convenience and cost savings for residents, Elizabethtown has started issuing 8-inch recycling stickers (similar to what is pictured to the left) to use for curbside recycling collection. Instead of purchasing a green recycle bin from the Borough, residents can now get free stickers from the borough office to affix to any container to be designated for recycling. 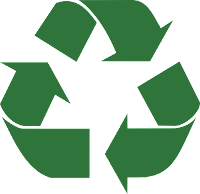 In the past, the borough purchased green recycling containers from Lancaster County Solid Waste Management Authority through a group purchasing process. Although the price has risen over the years, residents were charged just $5 to cover the costs. In 2012, the actual cost of the bin was $10.40. By using the stickers, the borough will save money while residents will have the flexibility to use any container for recycling that suits their needs. Of course, if you still have the green recycling containers, use them. However, new ones will not be available when the time comes to replace them. Instead, the borough will distribute the stickers free of charge. If you want to continue using a similar recycling bin, they are available for purchase at local improvement stores. Using the stickers complies with county and state recycling requirements and is acceptable to the borough's current waste hauler.